Key Transaction: On February 16, 1935, the Giants released Lefty O’Doul. One of John McGraw’s great mistakes had been trading O’Doul to the Phillies in 1928. O’Doul would win two National League batting titles before the Giants got him back in 1933. Top Prospects: Catcher Harry Danning, 22 years old in 1934, had appeared in three games in 1933 for the Giants as a pinch hitter and late-inning replacement. He would break camp with the Giants in 1934. Outfielder Hank Leiber, also 22 in 1934, had 10 plate appearances with the Giants in 1933, but would finally come up and stick with the Giants midway through the 1934 campaign. Memorable Quotation: On January 24, Giant manager Bill Terry sat with the press in New York before heading down to Miami for spring training. He was asked about the Giants’ chances, and on their competition. After commenting on the Cubs and Cardinals, he was asked about the Dodgers. “I was just wondering,” said Terry, “whether they were still in the league.” What he said was offered as a joke, and thought so little of at the time that it was only reported by two of the nine metropolitan dailies, but it would become one of the major sports stories of the year. 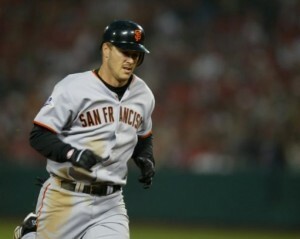 What Went Right: The Giants played very well, and had a five-game lead with three weeks to play. What Went Wrong: With four games left to play, they still lead by 2½. Unfortunately, they had to play that team Terry had joked about in January. New York baseball fans at that time did not generally travel to the rival’s park, but they would make an exception for special circumstances. The 1934 schedule concluded with the Dodgers playing a two-game series at the Polo Grounds. Terry found his friendly bleachers filled with hostile fans. The Dodgers won both games while St. Louis concluded a 21-7 September with a four-game sweep of the Reds. Bill Terry had earned his epitaph. An architect offers a proposal to encase Candlestick Park in a plastic screen “saran cloth” to shield it from the wind. Vice President Richard Nixon, at the first game at Candlestick Park, on April 12, 1960, called it “the finest ballpark in America.” He was wrong. There had been problems from the start. The park was saddled with two grand jury investigations of business deals leading to its construction. Teamsters went on strike, and the stadium failed to pass its first fire inspection because of inadequate exits. The state-of-the-art steam-heating system, designed to have 35,000 feet of iron pipe installed one inch into the concrete, was actually installed five inches into the concrete, rendering it useless. The umpires during the first game discovered that foul poles were accidentally placed in fair territory. The cost to construct the park went over budget by $10 million, and not surprisingly, the stadium wasn’t finished in the time mandated by the bond issue that funded it. But none of these were the worst of the new stadium’s features. When the site had originally been chosen, officials had toured it in the morning. However, by late afternoon there was a strong wind coming in off the San Francisco Bay. The park’s orientation actually made the wind, sometimes feeling hurricane-like, worse. Home runs were made into pop-ups, and fielders circled under fly balls trying to gauge where they would drop. Sam Cohen, a minority owner of the Giants, suggested in 1962 a plan to alleviate the wind problem at Candlestick Park. His $2.3 million fix would wrap the ballpark with “Saran Wrap.” An architect prepared a drawing, but the rendition omitted the light towers, and so it is was not clear how much thought had been given to whether the light might have penetrated the plastic top during night games. How Many Good Giants Were Good Prospects? Usually one sees this the other way around — how many good prospects became good players? It’s the foundation of any good prospect analysis, and indeed what we see is that higher-ranked prospects usually perform better in the majors than lower-ranked prospects. If we didn’t see such a difference in future performance, we’d certainly have to rethink the ranking process, or whether to even rank prospects at all. But when one focuses on ranked prospects, one ignores a massive amount of the player pool — those players who weren’t considered good prospects. Now, all players in professional baseball are great baseball players. Everyone in professional ball has some promise. The major leagues, though, are even more selective, and have the very best baseball players. But of those major leaguers, some had a lot of hype, and some had none. But I wonder, how many good Giant players were good prospects before that? There is no perfect way to analyze this, but there is a simple way to do so. I decided to use a cutoff of 3 WAR. So, for me, a good player was one worth at least three wins above replacement. For the prospect part I used Baseball America‘s historical top-100 list. They are an authority, and they’ve made it easy by providing rankings going back to 1990. So, for me, the definition of a good prospect was a top-100 prospect. I don’t care when the guy was a good prospect; so long as he was a good prospect at least once, that counted. I know any top-100 list doesn’t include all the good prospects. Intriguing players are always left off. But these are supposed to be the best 100 prospects, averaging about three prospects per major-league organization, and when you get into an organization’s mid-tier prospects, they are not expected to have big futures. They are not supposed to become 3-WAR players. That’s 33 post-1990-Giants with at least one 3-WAR season while playing for the team. (Barry Bonds, Ellis Burks and Stan Javier, who all had 3-WAR seasons with the Giants since 1990, did not make the list because their days as prospects predated 1990.) By my definition, that’s 33 “good” players. Of those, 18, slightly more than half, were ranked by Baseball America. Of those, 14 at one point ranked in BA‘s top 50. Tim Lincecum? He was a prospect. Madison Bumgarner? He was a prospect. Buster Posey? He was a really good prospect. Yet there were six 5+ WAR seasons put up by players who were previously unranked as prospects. Jeff Kent put up half of those. He was drafted by the Blue Jays in the 20th round of the 1989 draft and was the player-to-be-named-later in the 1992 trade that sent him to the Mets. He never ranked while in the Jays’ or Mets’ systems. Then there’s Rich Aurilia, who in 1994 — before ever playing a game in the majors — was traded by the Rangers to the Giants as part of a package for John Burkett. Now to answer the question, based on the method explained above, 55% of good Giant players were at one time good prospects. Which means 45% of good players were not considered good prospects. That doesn’t necessarily mean they were non-prospects — it just means they overachieved, relative to prior expectations, and this might be of some consolation to Giant fans whose team currently doesn’t score real well in farm-system rankings. Good players are typically seen coming, to some degree. Just not half the time. Players will surprise you, and there might be no better evidence than Jeff Kent winning the 2000 MVP award. Posted in Uncategorized	| Tagged Andres Torres, Angel Pagan, Aubrey Huff, Barry Bonds, Bill Mueller, Brandon Belt, Brandon Crawford, Brian Wilson, Buster Posey, David Bell, Ellis Burks, Felix Rodriguez, Hunter Pence, J.T. Snow, Jason Schmidt, Jeff Kent, John Burkett, Jonathan Sanchez, Jose Cruz, Juan Uribe, Livan Hernandez, Madison Bumgarner, Matt Cain, Melky Cabrera, Moises Alou, Noah Lowry, Pablo Sandoval, prospects, Randy Winn, Ray Durham, Reggie Sanders, Rich Aurilia, Robb Nen, Russ Ortiz, Ryan Vogelsong, Shawn Estes, Stan Javier, Tim Lincecum	| Comments Off on How Many Good Giants Were Good Prospects? Recently retired New York Giants player/manager John Ward thinks that the open sale of players has gone too far. “I wouldn’t play in Kansas City under any circumstances,” he says, but a club could force anyone to play there or not play at all. In 1885, shortstop John Montgomery Ward of the New York Giants was a rarity among baseball players, a graduate of the Columbia Law School, married to a lovely Broadway actress named Helen Dauvray, and willing to take on the club owners on their own terms. Ward denounced the reserve clause, which had been expanded and now kept every man on every roster from deciding for himself for whom he wanted to play. At a meeting in New York City, he helped found the Brotherhood of Professional Base Ball Players to fight against it. It was the players’ first attempt to organize. The Brotherhood went so far as to start it’s own league in 1890, the Players’ League, but in the end three big leagues — the National League, the Players’ League, and the American Association — simply proved too many. Attendance dipped dangerously low for everyone, and the Players’ League, undercapitalized, had to eventually sue for peace. The National League, triumphant, could afford to be generous. It offered a general amnesty. 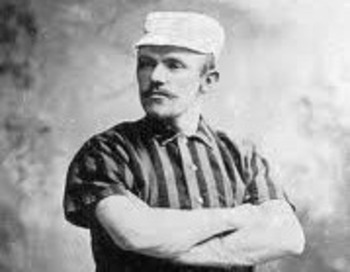 Ward, who had played for the Giants prior to 1890, was allowed to sign with Brooklyn, where he played two seasons before returning to the Giants as their captain. The reserve clause, however, remained firmly in place. One of Ward’s Giant teammates, Amos Rusie, was the dominant strikeout pitcher of the 1890s, leading the National League in Ks in 1890, ’91, ’93, ’94 and ’95. He was a consistent winner, going 36-13 in 1894, and 22-21 with a bad team in 1895. The Giants’ owner at the time was Andrew Freedman, whom Bill James accurately describes as “George Steinbrenner on quaaludes, with a touch of Al Capone thrown in.” Rusie had a number of run-ins with this madman, but when he drew his last paycheck in 1895, he found that Freedman had withheld $200 — the most one could make in a season at that time was $2,500 — for unspecified violations of training and indifferent pitching late in the season. Rusie understood that Freedman was simply lowering his salary without going to the trouble of negotiating it with him. He refused to report to the Giants in 1896 until the money was refunded. Freedman refused to give it back, and Rusie held out. For the entire season. The press supported him, the fans organized a boycott. Freedman would not relent. With John Montgomery Ward representing him, Rusie appealed to the league. He lost. He sued. The other owners pleaded with Freedman to be reasonable. He refused. Finally, the other owners got together and paid Rusie a reported $3,000 for the season he had missed. Rusie then rejoined the Giants for 1897. In 1943, baseball Commissioner Kennesaw Mountain Landis, at the request of Joseph Eastman, head of the U.S. Office of Defense Transportation, asked all major-league teams to train in the chilly north. This Landis-Eastman line replaced the Mason-Dixon line for baseball geographers, drawn as it was along the Ohio and Potomac rivers. Not since 1919, when the nearly bankrupt St. Louis Cardinals trained in a drafty gym at Washington University, had major leaguers welcomed a new season in such cold environs. The Landis-Eastman line made for some unusual spring training camps. The Dodgers relocated from tropical Havana to frigid Bear Mountain, New York. The Cubs swapped sunny Catalina Island for icy French Lick, Indiana. The Boston Braves, led by manager Casey Stengel, moved into the Winter Exercise Building at The Choate School in Wallingford, Connecticut, alma mater to Adlai Stevenson and John F. Kennedy. The vagaries of a northern spring regularly interfered with training plans. When spring training began, the golf course was blanketed in snow. It was cold more often than not, with a raw wind sweeping across the estate. Scheduled games against the Jersey City farm club, and intrasquad games, too, had to sometimes be abandoned. The rich, stable turf of the golf course, now maintained by the Giants’ groundskeeping crew, allowed the Giants to conduct batting and fielding drills with a minimum of interruption. Manager Mel Ott acknowledged to the reporters that it wasn’t Miami, but he had instructed his players to never squawk about the conditions. “There’s a war on,” he explained in an interview. There is no Florida sun. There are no bathing beauties. There are fewer steaks and it is tougher to get up a perspiration. There are more aches and muscles that never hurt before, squawks against calisthenics. There are dull hours. But there are good beds and long nights in which to rest in them. As another concession to wartime travel restrictions, Giant secretary Eddie Brannick announced an exhibition schedule made up of 13 games rather than the usual 30 to 35. It would open April 9, against a U.S. Army Air Corp team at Camp Mitchel on Long Island. The Giants would play the Boston Red Sox on April 10 at the Polo Grounds. Two games, April 17 and 18 at the Polo Grounds, would be against the Washington Senators. The exhibition season would close April 19, with a game against the U.S. Military Academy’s team at West Point, New York. Other games included tilts against the Fort Hancock coastal artillery and Ellis Island Coast Guard teams, at New Brunswick, New Jersey, and Lakewood, respectively. 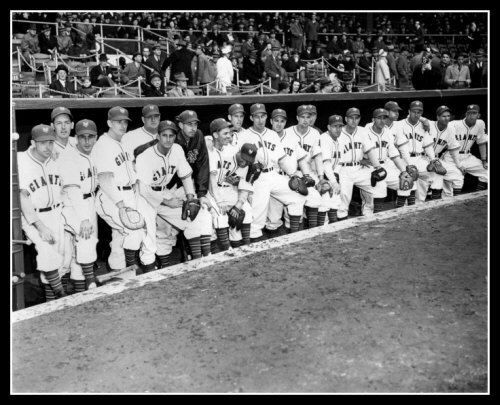 The Giants would also play the Jersey City “Little” Giants, both at Lakewood and at service facilities. Three of the exhibition games would be against the rival Brooklyn Dodgers, but only one of those three would be for the entertainment of Manhattan and Brooklyn fans. That game would be held on April 14 at the Polo Grounds. The other two Giant-Dodger exhibitions would be played before U.S. Army soldiers, the first on April 12 at Fort Dix, New Jersey, and the second on April 13 at Camp Upton on Long Island.